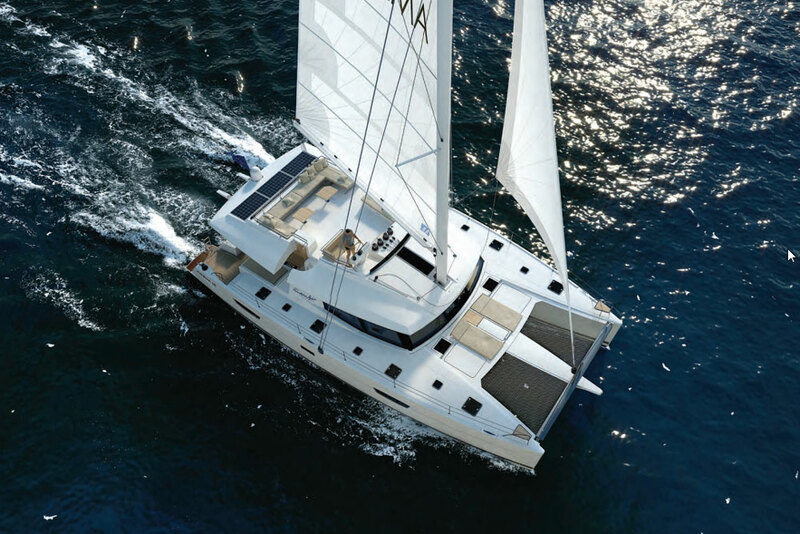 Catamarans have rolled onto the boating market like a storm on the horizon. First, there were sailing cats, popularized by charterers, and now power cats are getting their turn. More twin-hulled motoryachts are popping up at boat shows and they’re drawing crowds because of the space and amenities they offer. They’re every bit as large and posh as a second home with the added benefit that you can move them – at upwards of 24 knots in the case of the new Fountaine Pajot 44 MY. A collaboration between designer Pierangelo Andreani and naval architect Daniel Andreieu, the new FP 44 has added numerous new and ingenious ideas to what has become the standard use of space on a cat. With over 500 square feet of living space and exceptional fuel economy, she feels like a 50-foot trawler except that she can outrun storms and reach anchorages faster than any trawler possibly could. 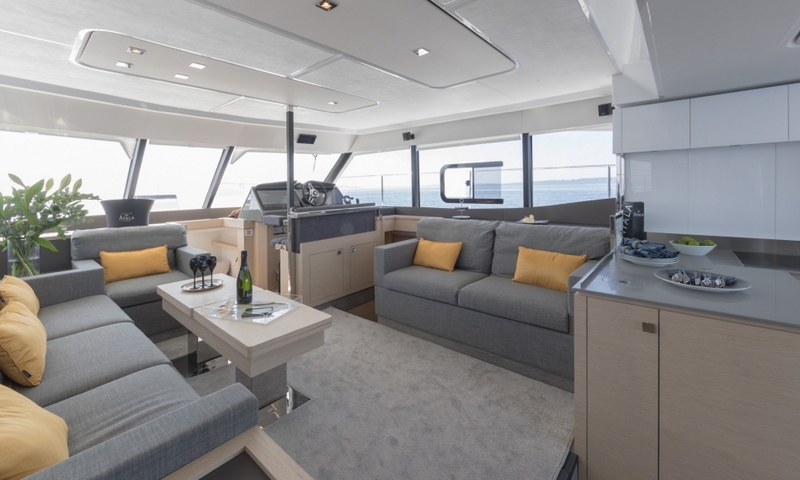 Fountaine Pajot seems to have studied the best of today’s luxury motoryachts and combined them with the benefits of a catamaran and the results speak for themselves. 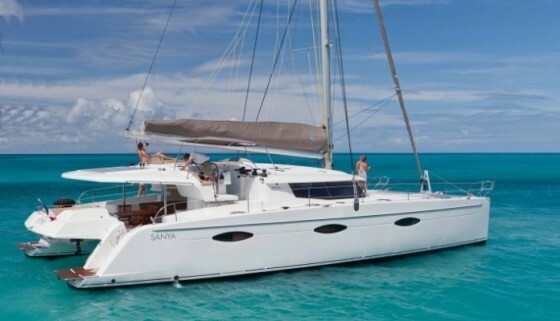 The Fountaine Pajot 44 seems to combine the best of today's luxury power catamarans. 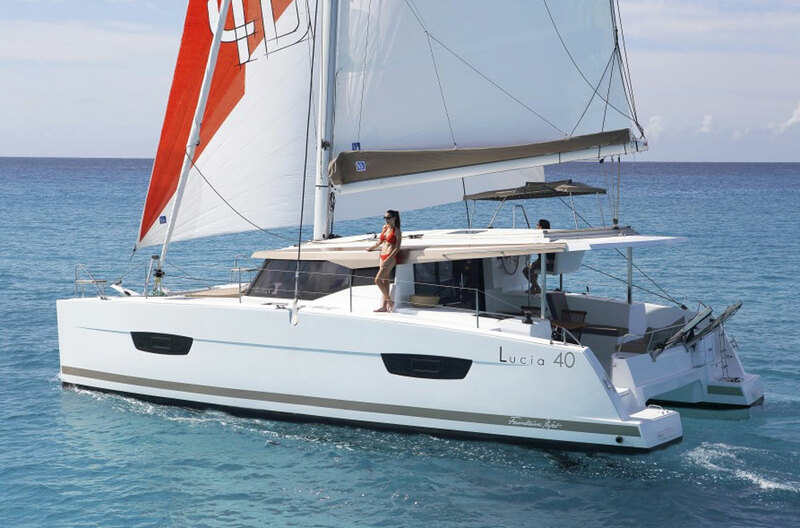 Everything about the Fountaine Pajot 44 is a little different from her twin-hulled contemporaries starting with the swim platform. 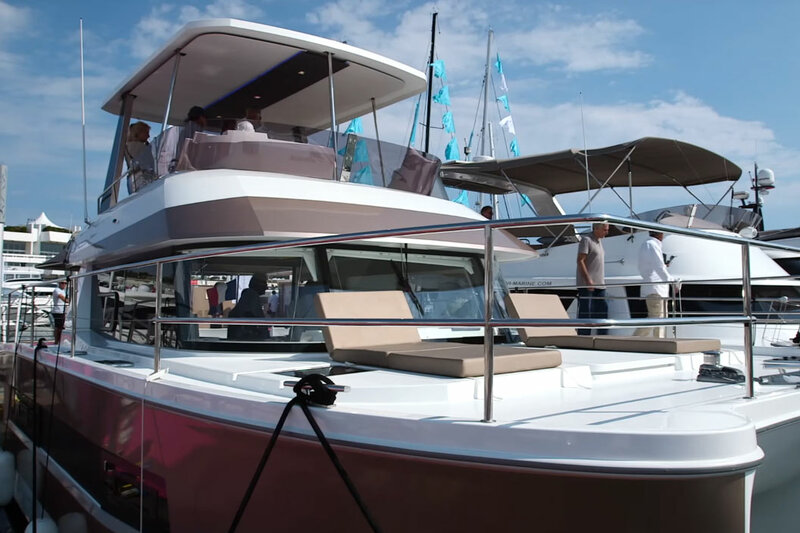 Instead of sandwiching the aft section between two fixed transoms, Fountaine Pajot has stretched the hydraulic teak beach across the entire 22-foot beam so you step onto the platform to board the boat from the dock and then move up the three transom steps – more like on a traditional motoryacht. When lowered, another clever hidden set of steps automatically elevates from the platform deck below so you can easily walk up even when it’s submerged. Gone is the traditional catamaran aft cockpit with a large outdoor dining area. Instead, only a row of transom seats faces forward toward the galley. The glass doors open completely to port so the inside and outside meld. Four can easily keep the chef company over a glass of wine before ascending the circular stairway for dinner. 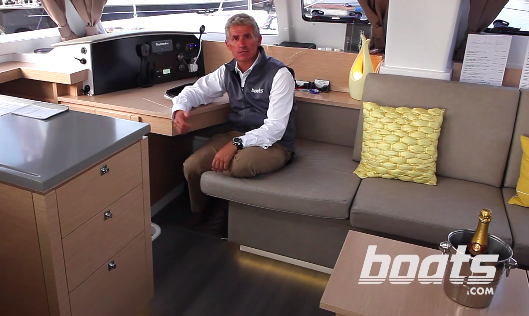 The main outdoor dinette, with seating for up to eight and a second galley module (that includes a sink and refrigerator) is up on the flybridge and it seems smart not to have to duplicate the concept below. Another complete rethink is propulsion. The Fountaine Pajot 44 MY comes standard with 260 hp Volvo Penta IPS 350 diesels but an upgrade to 435 hp IPS 600 is available. The IPS drives add joystick control and although cats are already a snap to drive with the props set far apart, the joystick now dials in fingertip docking. 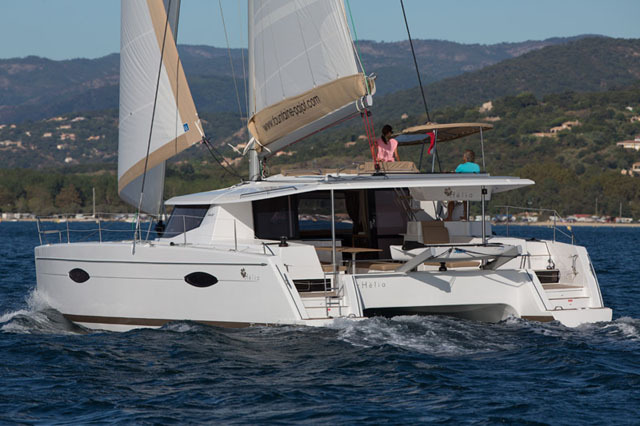 Like motor yachts (and unlike sailing cats) the Fountaine Pajot 44 has twin helm stations. Both the interior and exterior helms are to starboard and both have room for twin multifunction displays. 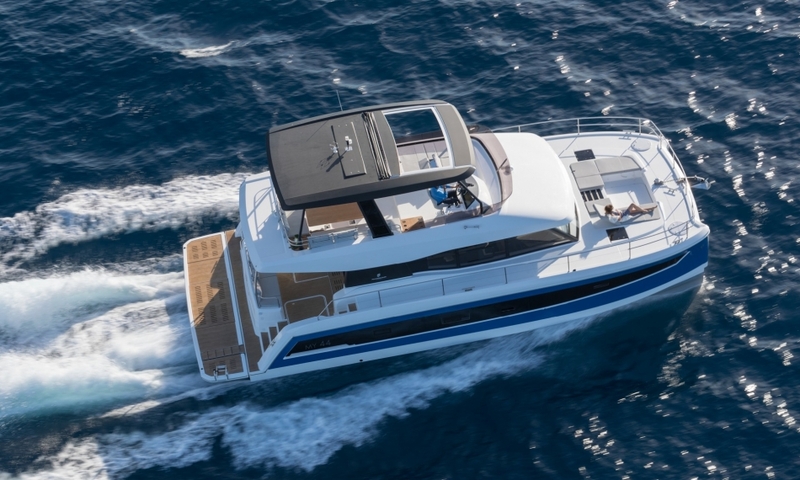 Unlike a cruising monohull that drags a ballasted keel through the water, the powercat is a semi-planing hull, which translates to good fuel economy. With the upgraded engines, the stop speed is nearly 24 knots. A cruise at 18 knots will deliver a range of 350 nautical miles and if you slow down to 8.5 knots, that range extends to 600 miles. The emphasis on living large includes a 125 sq ft saloon, a 130 sq ft flybridge and a luxurious 160 sq ft master stateroom. So far, Fountaine Pajot has introduced only an owner’s version with the master stateroom in the port hull. The bed is athwartships and is in the middle of the hull where motion will ne minimized for greater comfort. Guest accommodations are in the starboard hull with two cabins (another small crew cabin amidships is optional). Will a charter version soon appear with mirror hull layouts? Maybe. The inside-outside living space is impressive. Another unique space is forward and amidships with access down a few steps near the interior helm. This can be configured as a cabin, a laundry room or an office. 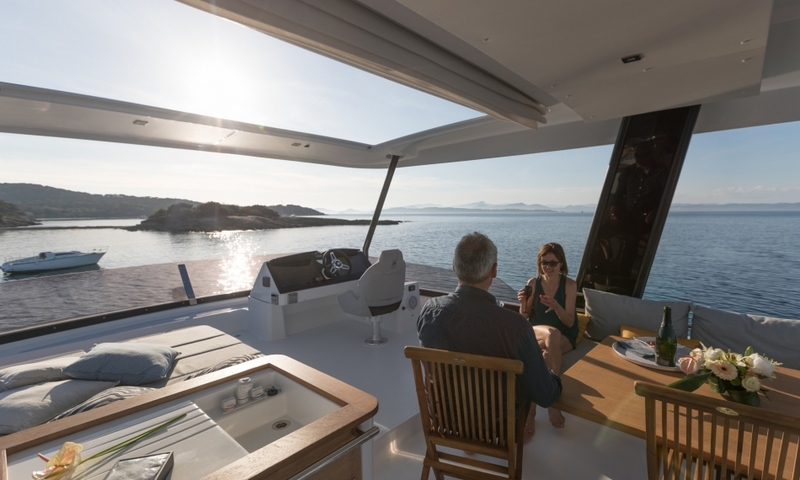 It’s a tight space but certainly versatile since Fountaine Pajot is willing to work with owners to design what is needed. With a serious cruising range and decadent owner accommodations, it’s likely this cat will be used for distance cruising and that means bringing along stuff – and lots of it. The need for extensive stowage space wasn’t lost on Fountaine Pajot as they packed every nook and cranny with a lid, a drawer or a cubby. For example, there’s exceptional emphasis on under-sole stowage with seven cubbies in both hulls (staterooms). This concept continues up in the saloon and galley where underfoot lockers are accessed with a suction cup rather than built in latches that tend to catch dirt. And oh my, the bevy of drawers. Just one bulkhead in the master cabin includes five soft-close drawers and those proliferate throughout the rest of the boat as well. Even the double-door household sized fridge has vertical bottle stowage immediately to its right. That makes wine within reach of the chef and what could be better? Most exterior seats have lockers below them and there’s even a starboard bow locker with deep space for fenders and lines. No space inside or out has been overlooked as a potential pocket for something that owners on a long cruise will need. Even guests can be stacked on sunpads for six without impinging on the ample seating aboard. Finally, I appreciate the practicality that will likely keep this cat out of the boatyard with endless repairs to auxiliary equipment. For example, both the soft sunroof on the flybridge and the shades on the generous saloon windows are manual rather than electric. That makes two things less likely to break. Also, the overhead is textured to look like vinyl but is actually fiberglass. That makes it cheaper to make without losing any aesthetics. And a nod goes out to the side decks that are two feet wide and easy to maneuver. The seating area around the steering column makes for sociable cruising. There’s very little to complain about on the MY 44 so this is a nitpicky list to be sure. First off are the fuel fills. They were placed under the cockpit sole right behind the glass doors to the interior. Having fueled a sufficient number of boats in my time, I know that this will mean drips and leaks in the cockpit as hoses get dragged onto and virtually inside the living spaces. The reason for this may be that the engines are fairly far forward with access via two hatches in the cockpit sole. Also in the engine rooms are house batteries (port) and the Fischer Panda genset (starboard). (A middle hatch provides access to the liferaft.) Visits to the fuel dock will feel a bit invasive, especially with guests in the cockpit. Also, the helms are large enough to accommodate twin MFDs or one MFD and then oddly arranged peripherals such as the Volvo Penta engine screen, autopilot control and some rocker switches. I’m not certain where these extras go if twin screens are chosen unless their functionality is incorporated into the MFDs as some brands allow. Finally, the saloon TV seems both a bit small and difficult to see from anywhere but the starboard side saloon settee. To allow for more headroom in the cabin below, it slides out from behind the galley cabinetry rather than popping up. That seems to limit its size as well as the viewing angle. Clearly, this is a minor point but with everything else aboard so upscale and well thought-out, this is a detail that could use addressing. This is a cat you can live on as a second home. In fact, this is a cat I could live on as a primary residence and lack for nothing, not even a home office. Au contraire, I’d have the added benefit that I could move my full-time home from port to port – at 20 knots. Now that’s an idea I can get behind.